I resized nitrofiles\stages\yoshi\yoshi from 512x512 to 128x128 and everything loads fine. 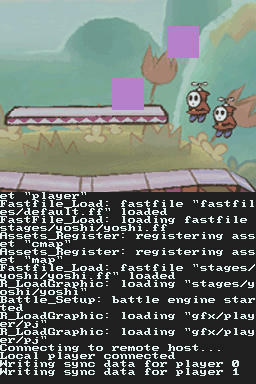 elhobbs wrote: I resized nitrofiles\stages\yoshi\yoshi from 512x512 to 128x128 and everything loads fine. The 512x512 background was being loaded as a 16bit image in VRAM. That by itself uses all of the VRAM the ds has available. It think the ne lib uses some of that VRAM for tracking allocations. So I do not think it would even fit by itself. In any case it leaves you with no place to load anything else. Meh... Then, any idea/suggestion how I should do the graphics? I dont know how to directly work with the DS hardware, I've always used a lib for that (like NFlib, PAlib or NitroEngine). I've though about create a somewhat optimized tileset of the background and do like PoKéMoN for GBA did (have a background a bit bigger than the screen and copy tiles over from the RAM) and switch back to sprites, could it be the best way? I am not saying that there is anything wrong with nflib. I am only pointing out that the assets you are trying to use are not particularly suited to the ds. keep in mind the ds screen resolution is 256x192 so you do not really need huge images. also you should probably look at 8bit or even 4bit textures rather than 16bit textures. 16bit images require twice as much vram as 8bit images. you may also want to take a look at libgl2d. there is a link on the portal page or just search the forum. elhobbs wrote: I am not saying that there is anything wrong with nflib. I am only pointing out that the assets you are trying to use are not particularly suited to the ds. keep in mind the ds screen resolution is 256x192 so you do not really need huge images. also you should probably look at 8bit or even 4bit textures rather than 16bit textures. 16bit images require twice as much vram as 8bit images. I've just changed the textures to 8bits (and indexed 'em as required by NitroEngine), now it loads just fine, but still has some weird problem. Sounds like a palette issue. The original images load fine for me. Try a different image with more colors and details and see if you get something recognizable. Also try it out in desmume use the VRAM tools to see if the images are loaded correctly. elhobbs wrote: Sounds like a palette issue. The original images load fine for me. Try a different image with more colors and details and see if you get something recognizable. Also try it out in desmume use the VRAM tools to see if the images are loaded correctly. Probably some code is doing what Its not supposed to and corrupting memory, the thing that annoys me is that the libnds exception handler doesn't get fired even on real hardware. I think the first issue is just a symptom of using nitrofs which appends the data to the rom. The second issue is more likely the problem. That it is complaining about the second texture slot which is not displaying correctly sounds like it is the issue. This can also be a false positive if you use the texture prior to it being loaded in VRAM. Say if you glflush then load the textures. To be clear I compiled your code after resizing the 512x512 image to 128x128 and everything displayed correctly. Including the pink dot player image. Also I meant for you to check that both the palette and the image loaded correctly. Is the pink dot supposed to be on a transparent background or solid. You may want to try turning on palette 0 transparency and see what you get. This is also why I suggested a different image with more color and detail. elhobbs wrote: I think the first issue is just a symptom of using nitrofs which appends the data to the rom. The second issue is more likely the problem. That it is complaining about the second texture slot which is not displaying correctly sounds like it is the issue. This can also be a false positive if you use the texture prior to it being loaded in VRAM. Say if you glflush then load the textures. I still need the stage/yoshi/yoshi image to be 512x512 as its the game background and I do not want it to look weird, so i changed the function to load images to NE_FATMaterialTexLoadBMPtoRGB256 as its used to load 8bit textures, this way the big image fits in VRAM with all the sprites. I already tried the transparency thing, the result is no sprites displayed (as first color in the palette is used as transparent color). It should display a white box and a small transparent rectangle in the middle, but anyway, even with more complex sprites the result is the same, a box of 32x32 with just one color (the first in the palette). EDIT: Nevermind, just fixed it. Once again the big texture was the issue. Resized it to 256x256 and everything seems to work fine. It looks a bit crappy when resized to 512x512 but I'll keep it as It doesnt really look bad at all.